The 3M Scott Safety Flite COV is a positive pressure Supplied Air Respirator that also provides emergency respiratory protection and escape capability allowing the user to enter hazardous atmospheres including those identified as immediately dangerous to life or health (IDLH). CEN type coupling as standard; other connections available. Features the time-proven Scott Tempest Demand Valve with low inspiratory resistance, automatic first breath activation and responsive dynamic performance. • In the event of an interruption of air flow from the primary supply source switchover to emergency cylinder air supply is immediately activated by the automatic change over valve to facilitate safe egress. Warning whistle informs userswitch has been made to cylinder air. If needed, the switch to the emergency air supply cylinder is accomplished by an automatic change over valve greatly simplifying response to a stressful situation. 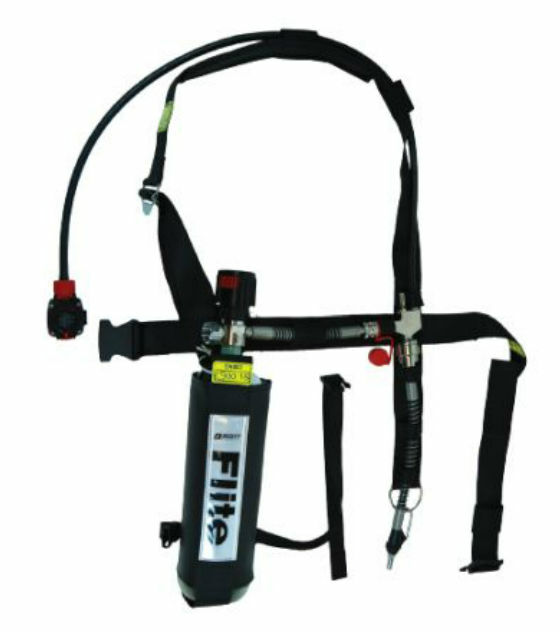 The unit also features a flame retardant polyester harness with stainless steel buckles, combined cylinder and pressure reducing valve assembly and a rugged mask-mounted demand valve with automatic first breath activation. The FLITE COV is versatile and can be used in applications like confined space entry, hazardous materials handling and any number of general maintenance tasks in a wide variety of industries including chemical, petrochemical, oil & gas and public utilities. CYL-FLITE-15 (COV 3.0 litre, 200 bar cylinder for FLITE apparatus with combined cylinder valve with locking handwheel and regulator, giving a rated duration of 15 minutes*. The steel cylinder is to CE specification and comes complete with pouch and connection hose to apparatus. (Cylinder capacity 600 litres). Fully charged weight 5.6kg. CYL-FLITE-SL (COV) 2.0 litre, 300 bar superlight carbon fibre composite cylinder with combined cylinder valve with locking handwheel and regulator, giving a rated duration of 15 minutes*. The cylinder is to CE specification and comes complete with pouch and connection hose to apparatus. (Cylinder capacity 540 litres). Fully charged weight 2.3kg. * Duration calculated using an average wearer consumption rate of 35 litres per minute as per EN402. Rated durations are increments of 5 minutes as per EN402. Charged cylinders are classed as hazardous and may not be sent by certain types of carriage. Cylinders may be supplied in accordance with other national specifications. 2031604 Spare cylinder pouch for CYL-FLITE-15. 1034988 084.213.00 User instruction manual. 1034745 084.059.01 Breathing apparatus log book - Industrial version. 1035996 089.386.00 Testkit and toolkit. 1035997 089.386.01 FLITE Testkit only.